On view through May 31, “Painterly Pasted Pictures” at FreedmanArt in New York is a small but smart exhibition that brings together a group of collages from the 20th century united by the stylistic trait of “painterliness.” Popularized by Swiss art historian Heinrich Wolfflin, painterliness describes paintings that are loosely and openly styled, with emphasis placed on visible brushstrokes and the application of paint rather than on the sharp delineation of forms and objects. 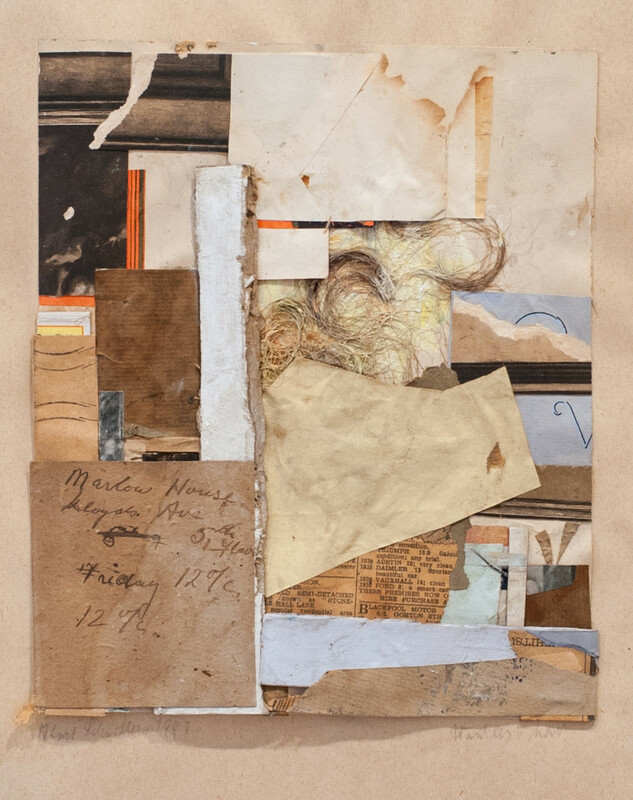 Featuring rare collages from Willem de Kooning, Helen Frankenthaler, Franz Kline, Alfred Leslie, Robert Motherwell, Anne Ryan, Kurt Schwitters, Jack Youngerman, Frank Stella, and Ellsworth Kelly, among others, the show has been carefully selected to demonstrate different manifestations of painterliness in the collage form. Curated by E.A. Carmean Jr, “Painterly Pasted Pictures” traces the development of painterliness in the collage medium from the 1940s to the 1980s. The earliest collages, done by Georges Braque and Pablo Picasso in the 1910s (not in the show), were crisp, linear, cubist, and consisted of little more than line drawing over cut paper pieces. Following World War I and the changes in cubism seen in the 1920s, Braque, along with Jean Arp and Kurt Schwitters (where the show picks up), began to explore collages with two new and important changes: first, they were composed of many more cut profile shapes and pieces, and, more importantly, the cut pieces were fit together in an overlapping construction, thus varying the collage’s surface pattern and allowing it to “read” with a visual flicker similar to the surfaces of heavily impastoed High Baroque and Impressionist paintings. Though Braque, Schwitters, and Arp were the pioneers of non-linear collage, it was the abstract expressionists and other non-cubist artists of the 1940s who really began to explore all the possibilities of painterliness in the collage medium. 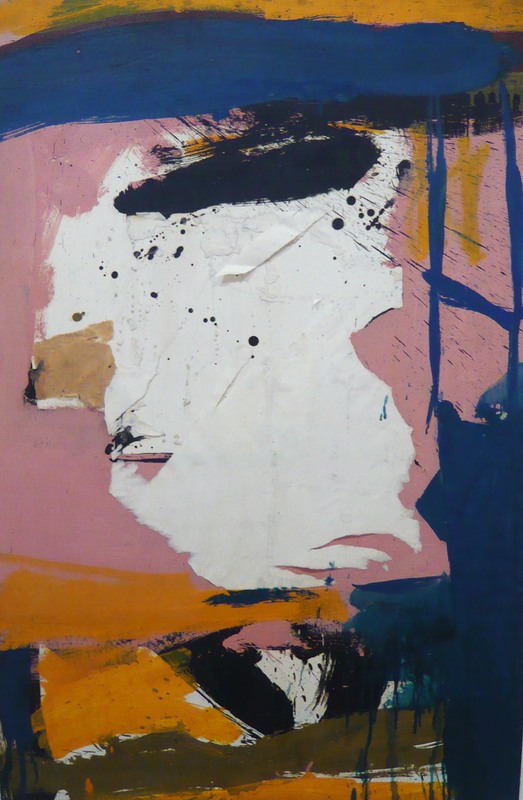 The abstract expressionists in particular seem to have found the different medium especially stimulating, with fine works on display by de Kooning, Robert Motherwell, Franz Kline, and Michael Goldberg, among others. By replicating their bold, fluid, and gestural brushstrokes by other means and on a smaller scale, one could say the abstract expressionists were making “still lifes” of the painterly qualities that they were working so hard to cultivate on their canvases. Or as art historian H.H. Arnason said of Motherwell’s collages, “the violent tearing of paper became … the equivalent to the immediate automatic brush gesture in painting” – a comment that applies equally to the other ab-ex collages in the exhibition. Motherwell does this to a remarkable degree. 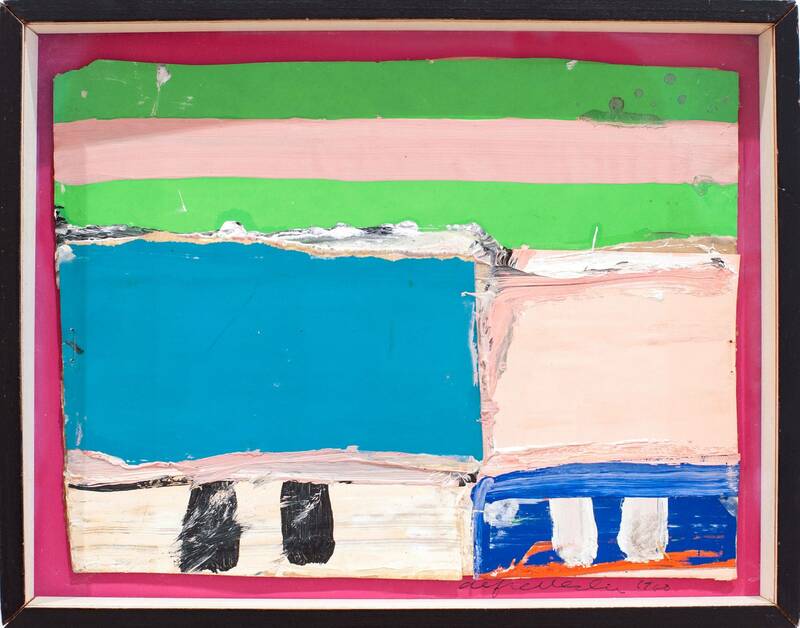 His collages really do look like his paintings; one has to look hard at them to tell what is paint and what is not. In fact, the exhibition as a whole is one that rewards close looking. Upon further inspection one finds on the collage surfaces an extraordinary variety of paints and fabrics, bits of paper, photos, wood, wallpaper, newspapers, stamps, US customs documents, human hair, tape, glue, pencil marks, pen marks, crayons, and several other things common and uncommon. The chief virtue of the exhibition is its organization. Though it’s often helpful to arrange works conventionally in chronological order, this show achieves its coherence by organizing the collages around their formal qualities. Every work in the show shares a slight visual characteristic with the image before it, and hints at characteristics that are fully fleshed out in the work that follows. Thus the exhibition unfolds somewhat like a Japanese hand scroll, with each work gently tugging the viewer along, and drawing us deeper into the show’s argument. It’s a neat trick when done this well. Over a short span of three collages, the viewer moves from an abstract arrangement of brightly colored squares by Alfred Leslie, to an egg shaped collage of pastel colored fabric cubes by Anne Ryan, to a Joseph Cornell collage composed of pre-existing imagery and geometric drawing, all without batting an eye. Here are three very different pieces that just seem to logically, and unexpectedly, “fit” in this sequence. Though painterliness obviously has its roots in painting, this exhibition shows how easily and successfully the concept can be applied to other mediums; painterliness is, in a sense, materiality, which is why collage – the mixing of different materials and forms – seems to be one of the best mediums to demonstrate this visual effect. FreedmanArt is located at 25 E. 73rd Street and is open Tuesday through Saturday from 10:00 a.m.to 5:30 p.m.
Brendan Dooley is an Editorial Intern at The New Criterion.